Olsberg is a very popular holiday destination in the heart of the Sauerland, nestled in an unique and diverse landscape. 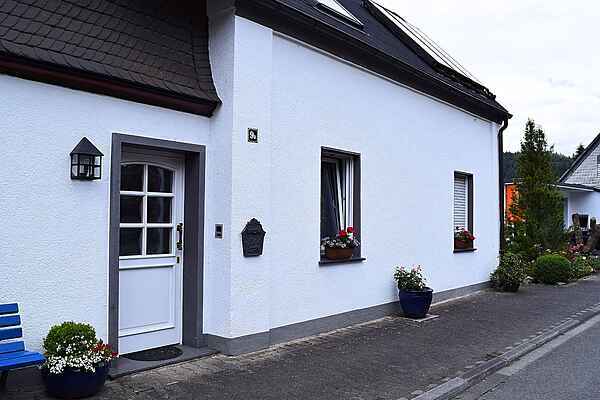 You'll spend your holidays here in this holiday home, which is just a few minutes' walk away from the town centre. The house is located in a central but quiet setting. On the terrace, you can enjoy the unspoilt view of the surrounding area and mountains. The newly renovated holiday home provides ideal conditions for a relaxing holiday. The wood-burning stove in the living room creates a cosy atmosphere. The town is also known for its activities. Over 50 mountains rise throughout the urban area, including the Langenberg, which is the highest mountain in North Rhine-Westphalia at a height of 843 metres . Thus, Olsberg is able to offer the best conditions for hiking and cycling. Relax through direct contact with nature and leave the daily grind behind you. This modern, small town invites you to linger - several stores provide shopping opportunities, you can stop at the historical restaurants and savour the culinary delights of the Sauerland or make use of the numerous offers you'll find in this Kneipp health resort. Popular sights in Olsberg: Bruchhauser Stones, Philipps mining tunnel and several museums. Popular destinations in the region: Theme park Fort Fun (20km), lakes Hennesee and Diemelsee including boat cruise (20km), mining museum Ramsbeck (15km), Bike Arena Winterberg (20km). Even in winter, the region leaves nothing to be desired - and the well-known ski resorts Winterberg (20km) and Willingen (15km) are also just a short drive away.